This Nativity (nacimiento in Spanish) was made by Joaquin Vasquez of San Martin Tilcajete near Oaxaca, Mexico. 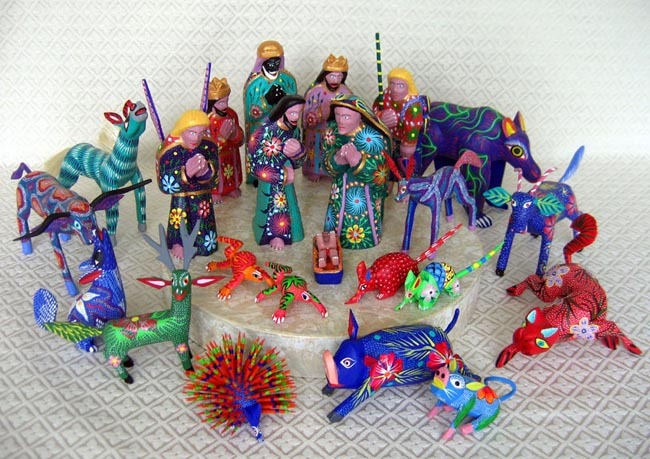 The style of the Nativity is alebrije, which is a Spanish word meaning imaginary or fantasy. This surreal style of wood carving has been produced since the 1980s in three small villages in the State of Oaxaca in southern Mexico. Fifteen animals native to Mexico join this hand-carved and hand-painted scene. Moving clockwise from the back as pictured: a bear, a cow, a donkey next to Mary, a jaguar, two pigs, two armadillos, two iguanas, a porcupine, a deer, a howling coyote, a bull, and a burro. The Nativity is also unusual because the painting on the back of the figures is so intricate—the scene looks good from any direction. The set is signed by artist/carver “Joaquin Hernandez Vasquez, Oaxaca.” Most of the human alebrije figures are about 6 inches tall. We also have a set by this artist that is 4 inches tall. The wood comes from the local copal tree. The copal is a hardwood tree but the wood is soft when it is green, which makes it easy to carve. When dried, the copal wood sands to a porcelain-like finish that is a perfect surface for paint. The alebrije figures are roughed out with a machete then refined with a pocket knife. A small alebrije might take hours to carve; a large one, days. Once the carvings are dry, they are sanded smooth and then covered with a base coat of paint. Over the base coat, patterns of intricate brushstrokes and dots are applied. Alebrije carvings can have two or three thousand dots per figure. Producing these figures is a family activity: the men and boys usually do the carving while the women and girls do the painting. Small children help with the sanding. The people of Oaxaca have been carving toys and masks for hundreds of years. Their whimsical and exuberant wood carvings of today are a natural progression of their traditional wood carvings. Some of thealebrije carvings are mythical creatures with roots in ancient Mexican religious beliefs. Many of their painted designs have roots in the culture of their Zapotec Indian ancestors.